Custom Car Magnets can easily help in turning your commute into a branding opportunity and it easily modifies your vehicle into a portable advertisement channel. Today, you can avail car magnets in variety of sizes and shapes from any reputed online stores stocking custom magnets or typically custom car magnets. Usually these car magnets are fixed to the bumper or car doors for better visibility. As part of smart marketing, many companies have started distributing these car magnets amongst their employees, customers, clients and business partners. Advertising means positioning your product before customers in a thought provoking way isn’t it? !Perhaps you might have done it always through print, tv commercials, Facebook, but with custom car magnets, you can easily do it on move. You do not have to meet customers at their home or road, but your car will do the job. You can use a car magnet to position your business messages, social information, or fun information, too. Unlike billboards which remain stationed at a place, these magnets make impressions on go. You can stay assured that your message is going to be seen and appreciated by the audience because they cannot simply ignore the information imprinted against them in colors. Contrary to the misconception, custom car magnets are affordable because they are offered in variety of shapes and sizes. You can find the one, which is small (in shape of your brand logo) or in typical circular, triangle or square shape or the ones, which are large enough to span across spectrum of vehicle. When you make posters, you have to work hard to portray your emotions, but with magnets it becomes easier because you can find them in shape of your requirement. 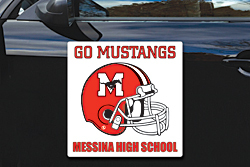 Sizes – You can find custom car magnets in sizes as small as 1.75x 2.25 to 24×24 inches. You can also find medium sized magnets, which may fall lightly on your pocket, yet help you to deliver the right impact without compromising on the quality. Shapes – If we say, sky is the limit of imagination, when it comes to predicting the different shapes of car magnets. Of course, you can find something as big as a poster, which looks like walking billboard and on the contrary, you can find something in shape of your brand logo or shape of a sliced pizza or anything, which look great from the bumper of the car. Today, with advancement in magnetic marketing, you are sure to find something, which perfectly matches with your business requirements, niche requirements or to say, which aptly constructs your business symbolically. Don’t be surprised if you find the ones in the shape of motor cycle, guitar and many more. Thicknesses – Again there is no threshold limit on the thickness. You can find a magnet, which looks like a paper measuring 13 MIL or 17 MIL or find something as credible as 30 MIL car magnets. Although some may argue that 13 MIL magnet does the same job as the other car magnets. They are partly true, but you cannot expect it to last longer. It is always better to go for thicker magnets such as 30 MIL ones with UV proofing because you can expect it to face wear and tear. Today, you may find these custom car magnets sprawled across several online stores claiming to sell authentic custom magnets at cheaper prices, but you can always choose the one as per your discretion. Some of the real authentic ones will give you benefits of special pricing in the form of discounts on bulk orders and freebies such as free art setup, free online design proof and free shipping.